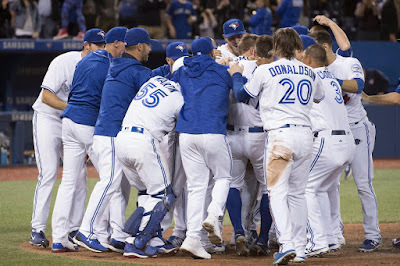 TORONTO - The Toronto Blue Jays were down and out going into the the bottom of the 12th inning after Matt Kemp hit a 2-out 2 run home run to put the San Diego Padres ahead by 2. The Jays managed to load the bases highlighted by a 14 pitch at bat resulting in a walk by Devin Travis. Jose Bautista then walked to to force in 1 run, Josh Donaldson hit into a fielders choice infield hit scoring Darwin Barney to tie the game at 6-6. With Edwin Encarnacion at bat and 2 out, Travis scored on a wild pitch to win the game.